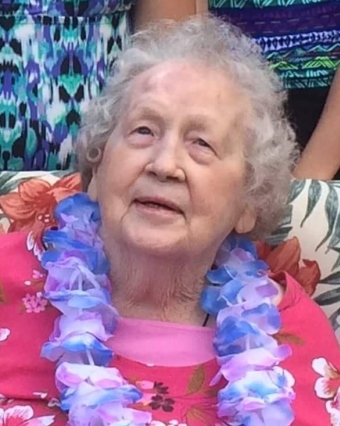 Marion “Maizie” E. Gordon, 86 of Hope Valley, passed away peacefully on September 17, 2018. Born on June 24, 1932 in Warwick, she was the daughter of the late Arthur W. and Lily (Walton) Ellis. Maizie had worked as a supervisor for Ashaway Line and Twine for numerous years. She was an avid collector, especially decorative thimbles from all over the world. She also enjoyed cardinals, which were one of her favorite birds. Traveling was a favorite activity, specifically trips to Foxwoods with her sisters. (Quite a spirited group to stumble upon! Her family would often threaten to send along a chaperone to make sure they stayed out of trouble.) Most importantly, she cherished her time with her family particularly her grandchildren and great-grandchildren. She was a great friend to many, always with a smile and a kind word for friends and acquaintances alike. Maizie would always be found sharing memories, stories and hugs. She truly possessed a beautiful spirit. She will be deeply missed by all who knew her. She leaves her children Janet Almy and her husband Stephen, Edward Gordon and his wife Debbie, Leslie A. Gordon and his wife Barbara, Wendy Gordon and her husband James Thompson, William Gordon and his wife Susan, Scott Gordon and his wife Jill and Heidi Lewis and her husband Don; 15 grandchildren; 20 great-grandchildren; and her first great-great grandson who will be born in November, 2 siblings along with numerous nieces and nephews. She was predeceased by her husband, Leslie “Cuddy” Gordon, 2 grandsons and 9 siblings. Funeral services will be held on Friday, September 21, 2018 at 10:00a.m. at the S.R. Avery Funeral Home, 3A Bank St. in Hope Valley. Burial will follow at Rockville Cemetery. Calling hours will be held on Thursday, September 20 from 4:00p.m. to 8:00p.m. at the funeral home.